We’re living under a pile of boxes this week, and I’m not quite convinced we’ll ever see the end of ’em. 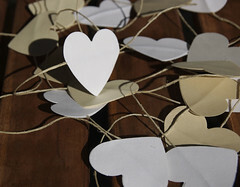 While I madly assemble boxes, and sort through the mountains of crap still left in my home, I hope you’ll pop over to my other blog on Scholastic for a simple Valentine’s craft: paper heart garlands. … Speaking of distractions! the folks from Disney hosted a party for local blogging mommas yesterday afternoon! I’m kinda wishing I wasn’t so fried by the time I got there, else I’m sure I’d have gotten in a bit more socializing. The boys had a blast even though Tor had no idea who any of the characters were — Maggie opted to go to a meditation-yoga-kids-crafts affair with her friend instead. Here’s a cheery picture of me with the SVMom Bloggers. I need to get Disney to sponsor a family trip or something :) That would be sweet! I may make that garland in Beckett’s class tomorrow. I am supposed to make a necklace, but have no ideas. I am the worst room parent!